Before the lesson students work individually on an assessment task designed to reveal their current understanding. You review their responses and write questions to help them improve their work. After a whole-class introduction, students work together in small groups on a card-matching task. 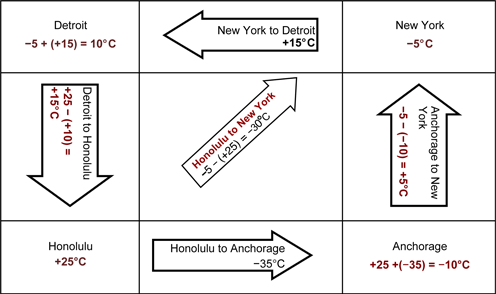 In the same small groups, they then create directed number calculations to correspond to temperature changes or city temperatures. To end the lesson there is a whole-class discussion. In a follow-up lesson, students again work alone on a task similar to the assessment task. Each student will need a copy of the assessment task Temperature Changes and Temperature Changes (revisited), a copy of the Temperature Scale, a mini-whiteboard, a pen, and an eraser. Each small group of students will need a set of cut-up cards from the sheets City Temperatures and Changes in Temperature, a glue stick, and a large sheet of paper for making a poster. You will also need one copy of the cut-up cards Introduction to Negative Numbers. 15 minutes before the lesson, a 100-minute lesson (or two 55-minute lessons), and 20 minutes in a follow-up lesson. Timings are approximate and will depend on the needs of your class.